Microsoft Edge has struggled with popularity since its debut. While it’s worlds better than Internet Explorer, years of putting up with IE have made people wary of any browser that comes from Microsoft. So it’s no surprise that most people only open Edge to download Chrome, Firefox, or some other browser The Best Web Browsers for Windows The Best Web Browsers for Windows What is your default web browser? Even though we're spoiled for choice, the majority of us stick to the tried and tested major players. What are better alternatives for resource use, speed, and security? Read More and never use it again. While Microsoft Edge isn’t a good enough default browser 5 Reasons Why You Shouldn't Switch to Microsoft Edge Yet 5 Reasons Why You Shouldn't Switch to Microsoft Edge Yet Is Microsoft Edge worth using while Chrome, Firefox, and Opera are still around? Is Edge good enough to be your primary browser? Read More for most people, it’s not so bad that you can’t use it once in a while. Thus, you should take a few minutes to personalize Edge in case you ever have to use it as a backup browser or want to maximize battery on your laptop with it. One of the best ways to make Edge your own is bringing in your bookmarks from another browser. In the Windows 10 Creators Update, you can do this with just one click. Open Microsoft Edge and click the three-dot Menu icon in the upper-right corner. Choose Settings to open that panel. Under Import favorites and other info, click the Import from another browser button. Edge will list the other browsers installed on your computer, so mark the one you’d like to import from and click Import. 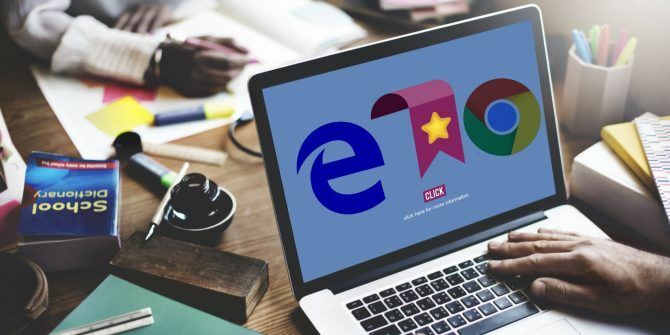 Edge will grab your bookmarks from Chrome, Firefox, and Internet Explorer. From Internet Explorer and Chrome, Edge can also import your history and saved passwords. That’s all you need to get Edge set up with your data from another browser. If you’d like to import from another browser that Edge doesn’t support natively, you can import an HTML file with your bookmarks exported from the other browser. Before you jump into using Edge, make sure you apply these other important tweaks 7 Tweaks You Should Make in MS Edge Right Now 7 Tweaks You Should Make in MS Edge Right Now Edge is still new, but there are lots of cool customizations and tweaks that you can make already, all of which will help Edge work exactly the way you want it to. Read More , too. Do you use Edge regularly, sometimes, or not at all? Have you imported your data and made other tweaks to personalize it for those times you do open Edge? Share your thoughts on the browser in the comments below! Explore more about: Microsoft Edge, Online Bookmarks. Why would you "occasionally" use ms edge if you already have a superior browser (which would be pretty much any current browser other than IE)? Doing so would just encourage them. I don't know why MS persists, they could just put install files for firefox and chrome on the windows installation and just let you decide. It's never a bad idea to have a backup browser. Perhaps Chrome could get screwed up and you'd need another to diagnose it. Or maybe you want to have another browser for "vanilla" operations so you can sign into another account. You might not use it often, but it's worth personalizing it so it's easier to use when you do. I've never found the need to personalise IE in all the years I've used it as a backup browser. Vanilla IE always worked to download a new Firefox distribution... or load one of the three remaining webpages that don't like it.